The 12volt Brutus Ace Line Hauler is the most efficient, easiest to use, and highest quality crab and prawn trap hauler on the market. 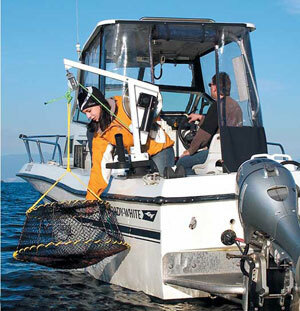 The Ace Line Hauler's simple one-person operation takes the work out of lifting prawn and crab traps. Powered by a Hi-Torque 12V Motor The Brutus hauls , with minimal assistance, lifting up to 45kg at 110 ft per minute. Ideal for hauling Lobster, Crab, Prawn pots, end weights, Anchors, and Mono line.